Sometimes our sensory needs don’t quite match up with our kids’ needs and preferences – and it can be intense. 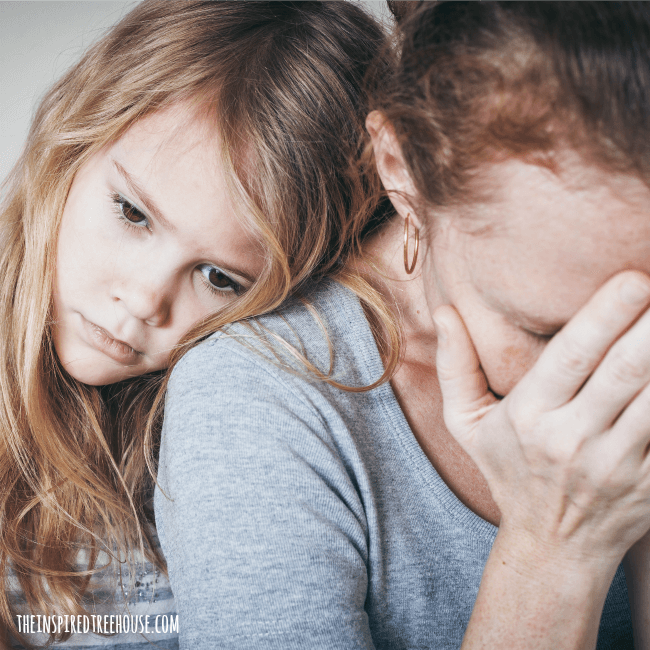 Learn more about how to navigate this parenting obstacle. It was the perfect beach day. Cloudless sky, smooth lake, and lots of heat and humidity. I was wearing the baby (who was finally just about to drift off to sleep), walking slowly up and down the sand when my middle son, 6 years old and a notorious loud-noise-maker, approached and began walking along next to me. The baby was one blink away from finally taking a much-needed nap when it started – the singing, humming, and constant noise making. I was exhausted. I needed a break from the baby’s squirming and whining. I was cranky. And I was sick of hearing kid sounds all. day. long. The baby’s eyes sprung open at the noise. 6-year-old (with a concerned look on his face): You wish you didn’t have me? This. This was a huge mom moment. Not my proudest moment, obviously…but a great big, in-your-face, wake up call mom moment. I felt embarrassed of my own words and guilty for not being able to control my anger and frustration…but also totally ashamed that I couldn’t get to the bottom of the situation. Because, truth be told, this had been going on for a long time. This incident at the beach was only the most recent in a long line of tantrums, fights, and meltdowns (his and mine) that I could trace all the way back to the first year of his life. I’m an experienced occupational therapist and I like to think that I’m armed with quite a bit of knowledge about child development. But I was so overwhelmed and so heavily involved that I couldn’t put my finger on it. All I knew was that it felt like my little guy and I weren’t matching up. So, the next time I had some quiet space to think. I took off my “mom hat”, put on my “OT hat”, and was finally able to uncover exactly what was going on. The answer? A little something I now refer to as a “sensory mismatch”. And yes. It’s exactly what it sounds like. When Your Sensory Needs Just Don’t Match Up: What is a Sensory Mismatch? We all have our own unique sensory preferences, aversions, and needs. So it makes good sense that, occasionally, one person’s needs and preferences don’t quite match up with another person’s needs and preferences. It also makes sense that one person’s sensory needs and preferences might actually result in behaviors that are completely at odds with another person’s sensory needs. And sometimes…that “other person” happens to live under the same roof. I don’t like silence. I don’t prefer silence. I need silence. I need it for my brain to function. When I’m exposed to loud or constant sound (i.e. living with 3 loud boys) for any extended period of time without a break, I lose it. I can’t think straight, I get cranky, I completely shut down. My second born child on the other hand craves sound with the same intensity that I avoid it. He hums, he sings, he screams, he yells, he makes the same sound over and over and over and over. See what I mean? Sensory mismatch. And I’m betting that we’re not the only family experiencing this exact same thing. -Parents who love to try new and different foods and recipes + a little one who is a picky eater and very sensitive to smells and tastes. -A dad who likes sports or adventurous outdoor activities + a kiddo who prefers quieter, less active play. All of these are sensory mismatches. And if you’re living in one of these situations, I don’t need to tell you that it can be intense. So intense that it can negatively impact the whole household because all of the members of the family aren’t able to get what they need without infringing on someone else’s needs and preferences. So what the heck can you do? Here are some things I’ve learned along the way. 1 || Work on transitions. Packing up/bundling up/getting ready to leave the house seems to be the toughest time for me when it comes to sensory overload. I notice that keeping things organized and planning ahead as much as possible are the two keys to success. For me, this means packing lunches, picking out outfits, and even laying out shoes, coats, and all of the essentials the night before. Does this mean it always happens? Nope. But when it does, I notice a huge difference in my ability to handle the chaos. This involves making sure that everyone in the household is able to get what they need sometime throughout the day. This could mean finding time and space for yoga/meditation if you crave silence like me. Or maybe it means lots of outdoor play after school for kids who really need to move. The secret for me was realizing that we don’t have to be together as a family all the time. Self-care can be a chance to celebrate your differences, for everyone to have their own “thing”, to explore their preferences and honor them. 3 || Find a buddy. Connecting with other parents and families is a great way to take some of the pressure off of the situation. Parents need to vent to other trusted parents when the going gets tough and kids tend to gravitate toward other kids who are a match for them. Having a network of buddies can also be a great way to get that time and space you need for self-care, while the kids play at a friend’s house. 4 || Find your common ground. Even when a significant sensory mismatch exists between you and your child, chances are that there are some aspects of your sensory makeup and your child’s sensory makeup that do match up. Do your best to find what that common ground is and use it to connect with your child. In our case, this means cuddling. We both love being wrapped up in a blanket on the couch together, reading or watching movies. It meets our sensory needs and also gives us a way to spend time together and connect. 5 || Learn more about sensory processing and talk it out. Learning more about the sensory systems and how they work together is another great way to support everyone’s needs. And once you recognize the sensory matches and mismatches in your family, don’t be afraid to talk about them! Explain what’s happening, validate both of your needs, explore and explain the sensory systems and sensory processing. Sensory Processing 101 and The Magic 7 Guide to Explaining Sensory Processing to Kids are great places to start. 6 || Divide and conquer. My husband and I find that it’s easiest to get everyone’s sensory and activity needs met when we’re one-on-one with our kids. So we often separate and engage in different activities on weekend mornings, meeting back up for lunch once we’ve gotten a chance to “do our thing”. This can mean splitting up the childcare duties with your partner, spouse, grandparent, or a sitter. 7 || Keep a consistent routine. Having a good routine can help guarantee that everyone in the household is getting what they need. For us, this involves daily quiet time, a consistent (and super early) bedtime, and a very structured morning routine. But this will be different for every family. Schedule in physical activity/rough house play, outdoor play, music time, messy play – whatever your family needs! 8 || Write it down. This is huge when you’re new at this whole sensory processing thing. At the end of the day, write down the instances that you remember when things felt “mismatched” between you and your child. For me, this equates to writing down all of the times during the day when I lost my cool, yelled, or felt like I was going to lose my mind (this happens a lot for me :). Then, with an understanding of sensory processing, I can look back at my notes and see that these were all actually times when I was feeling overwhelmed or annoyed by my kids doing the very things they needed to do to stay regulated, focused, happy, and in control of their bodies and behavior. Were they too close/touchy? Too loud? Too crazy/rough/crash-y? Whatever the case, when I can identify the mismatch, it allows me to find other ways to give them the input they need in a more proactive and/or pleasant way that doesn’t drive me insane. For us, this usually means going outside. Bigger space = quieter for me = more opportunities for movement, sound, and activity for my little noise-maker. What I was going to say was: I wish I could just have two seconds of quiet. What my little guy heard and felt: You wish you didn’t have me. Ugh. How I hated hearing those words, but if he hadn’t said them, I might not have been able to get to the bottom of our problem. And now it’s easy to see that it was all caused by a simple mismatch. 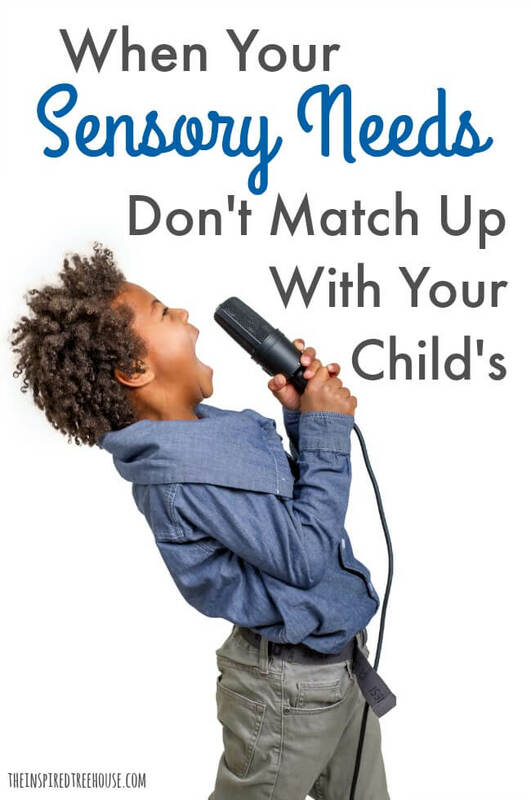 A sensory mismatch doesn’t mean that you’re not compatible with your child. It simply means that you’re different from your child. And that’s a great thing! Uncovering how your sensory needs might be mismatched with your child’s sensory preferences (or vice versa) can help everyone in the family feel more confident and secure and can be a great way to talk about and celebrate your differences. Thank you for this article – I can totally relate to the desperate need for quietness (and that from someone with tinnitus!) but it has made me reflect that outdoor spaces really do cater to both our needs, as do cuddling up reading books. Thank you for helping me to realise what was going on. Hi Joanna! Thanks so much for this comment. I’m glad this post hit home for you! I totally agree about being outdoors – it can really help! Oh, this post perfectly describes me and my daughter. I need the quiet, she needs to constantly be around somebody. One thing we do is have a “quiet time” in the middle of the day. She goes off and watches TV and I get to veg out and be alone. It keeps us both ready to take on the afternoon! Thank you Emma! So glad to hear I’m not alone! :) It can definitely be a challenge. We are also HUGE on quiet time at our house. It’s a lifesaver, isn’t it?